As Apple users, it is always frustrating to sync iPhone music/video/audio/picture to Mac with iTunes or iCloud. However, iPhone transfer to Mac is becoming urgent as iOS 10 and iPhone 7 are coming soon. How to move data on iPhone to MacBook Air, MacBook Pro, iMac 4K/5K to update iOS 10 or switch to iPhone 7? Here we share you an easy iPhone transfer tool. It allows you to sync music, video and movie from your iPhone X/8/7/6s/SE/6/5s, etc. to Mac computer, copy picture from iPhone to Mac with ease, fast creating a safe iPhone backup on Mac for iOS 10 update or newer iPhone 7 upgrade. This tool is a perfect solution for Apple iPhone, iPod, iPad users. It can even download data from iPod to Mac, iPad to Mac. Support file transfer from iPhone X/8/7/6s/se/6 Plus/5s to Mac, all genetations of iPhone, iPod, iPad. Move iPhone/iPod/iPad data to Mac computer at high speed (100 4k pictures will be done in 8s only). Directly download music/videos/picture from iPhone/iPod/iPad to Mac computer via drag and drop. Preview the files to make sure the files are the one you want to deal with. The guide below will show you how to put iPhone (music song, video, photo etc.) to MacBook Pro/Air/iMac etc. With the tool, you can easily put iPhone files like music, video, picture to Mac with blazing fast speed. Download iPhone file transfer, and run it on your computer. Connect your iPhone to your Mac computer, then all music, videos and pictures in your iPhone will be displayed on the main interface and sorted clearly in different catalogs. To transfer iPhone photos/music/videos, now all you need to do is to choose the right category. Select the files which you want export on the list "Photo Transfer", "Music Manager" and "Video" to drag and drop or click "Export" button. The iPhone data transferring software works well with iPhone of all generations, including the latest iPhone X/8/8 Plus, and even iPod, iPad Pro/Mini 4/Air and fully supports multiple iOS devices simultaneously. No other program currently on the market is able to do this with the same efficiency and speed. Now you can download the software and try it by yourself to copy video from iPhone to Mac etc. 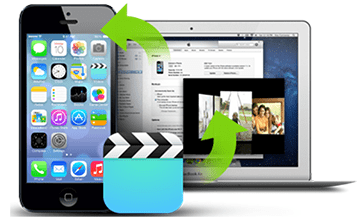 With best iPhone music manager, you're allowed to transfer music from iPhone to Mac (MacBook Pro 2016, iMac), as well as iPad iPod iPhone to Mac photo, video transfer without iTunes. 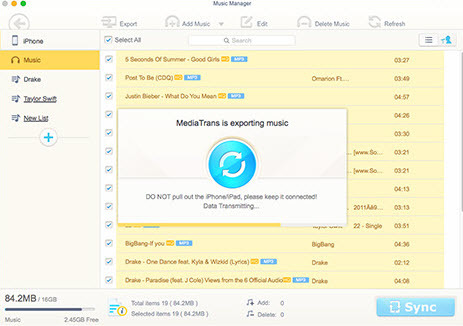 MacX MediaTrans is an all-in-one iOS iPod iPad iPhone transfer app to transfer iPhone to Mac computer, like transferring video/music/photos from iPhone iPad iPod to Mac and vice versa with world's fastest speed!